Miss Germany slams Miss Philippines – Sorry, Not Sorry! Vin Diesel on helium. Enough said. Never miss a thing! We'll tell you what's on fire and keep you in the know. A pro team of giraffes diving in the swimming pool for swim practice. 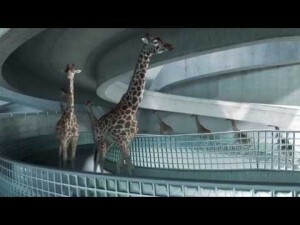 From the beginning of the video till the end, these giraffes show just how disciplined and well trained they really are. It definitely looks cool, bu aren’t they injured in the proccess of learning these things. Then I realized that is actually an animation, the guys who did this video did a good job. It is CGI, isn’t it? What on earth did I just watch?! I mean, it was kind of fantastic but I’m left wondering- what was the point of that? This video was a bit weird and eerie… It was quiet and it was like these giraffes were in the middle of no where… That was pretty sweet watching them do those carnival type of tricks though. I would pay to watch that in real life haha! This must be one of the strangest things on the internet… and that’s saying something! Random fun fact for you – giraffes have the same number of vertebrae in their neck as we do. Go figure. Copyright © TotalTV 2016. All right reserved FAIR USE: This site may contain copyrighted material the use of which has not always been specifically authorized by the copyright owner. I am making such material available in a effort to advance the understanding of environmental, political, human rights, economic, democracy, scientific, and social justice issues, etc... I believe this constitutes a 'fair use' of any such copyrighted material as provided for in section 107 of the US Copyright Law. In accordance with Title 17 U.S.C. Section 107, the material on this site is distributed without profit to those who have expressed a prior interest in receiving the included information for research and educational purposes. If any individual wishes to go beyond the fair use law, they should contact the copyright owner for permission.